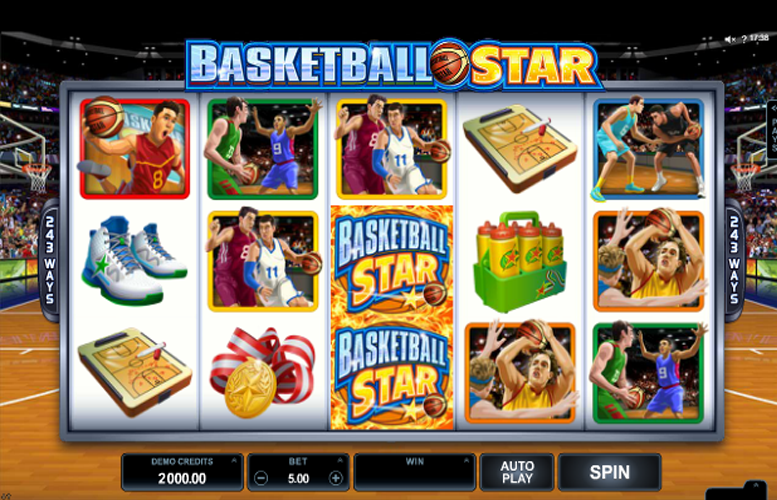 One of surprisingly few online slots to take their inspiration from the sporting, it is Basketball Star from Microgaming that’s the focus of this review. Sure to get players dreaming of being able to live the same lifestyle as a top NBA player, the slot has five reels, three rows and fully 243 ways to win. Basketball Star’s reels appear as if on a basketball court and are filled with symbols related to the sport and its players. Other than that, however, the game is somewhat lacking in interesting graphics or animation. What it has in abundance, though, are gameplay features which add both interest and extra winning potential. Basketball Star’s reels feature loads of wild symbols which substitute for all symbols bar the scatter to increase players’ chances of making winning combinations. What’s more, the wilds can also appear stacked on reels three, four and five. The special Wild Shot feature can randomly deliver up to two wild reels to increase winning potentially even further. Up to 25 free spins can be triggered by the game’s scatters, whilst the Rolling Reels feature can then deliver multiple consecutive wins and an up to ten times multiplier. The payouts provided by Basketball Star’s most valuable symbol combinations during the main game are a little stingy. Basketball Star’s theme is an interesting one but it is perhaps not very well executed. Symbols are quite simplistic and the game lacks something in terms of both animation and gameplay. The max jackpot on this game, available to be won during bonus rounds, stands at an impressive 120,000 coins. It would probably be fair for Basketball Star players to expect that the slot would have a bonus round or side game related to the sport it’s themed for. Unfortunately, that’s not the case, but what the game does have are lots of wild symbols and a related Wild Shot Feature. Wilds substitute for all symbols but the game’s scatter and can appear stacked on reels three, four and five. The Wild Shot Feature, meanwhile, can turn up to two whole reels wild at any stage during the game to deliver a guaranteed win. 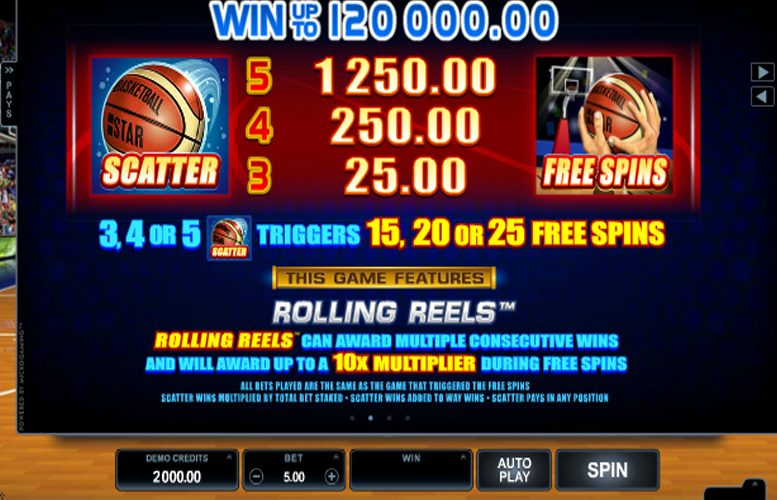 If three, four or five of the Basketball Star scatter symbols appear on the reels at the same time, 15, 20 or 25 free spins are triggered. During the course of those free spins, the slot’s Rolling Reels feature can deliver multiple consecutive wins and will award a multiplier of up to 10x, to massively boost a player’s winnings. Basketball Star is always played with its 243 ways to win active. In order to alter the amount they wish to bet per spin, players can select the number of coins they wish to wager and how much they wish each coin to be worth. Their selections will then have a 50x bet multiplier applied to them to determine the ultimate bet amount. Anywhere between one and ten coins can be bet per spin and those coins can be worth between 1p and 10p. The minimum possible bet, therefore, is a total of 50p (1p x one coin x 50) and the maximum is £50 (10p x ten coins x 50). Basketball Star is a slot with a lot of promise, which delivers on some of it but is a little lacking in other areas. Its sporting theme is sure to be popular with many players and the main symbols on the reels do feature interesting and attractive images. More could have been done with the basketball theme, however, with more immersive graphics and a side game being obvious additions which would have made the slot better. 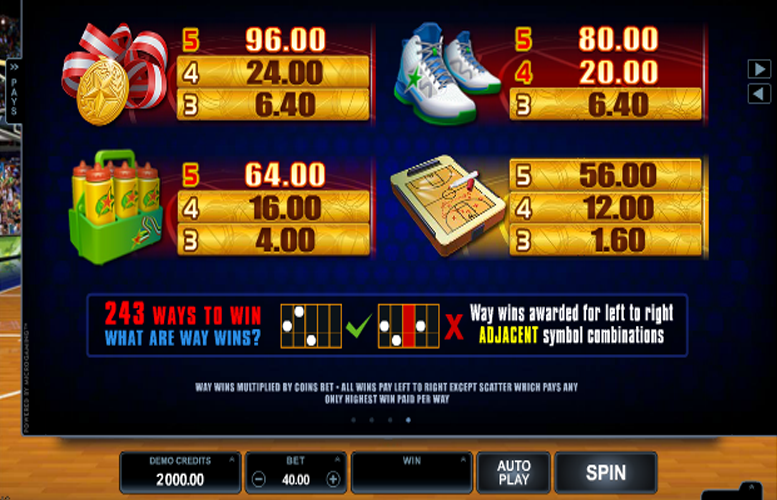 The slot’s payouts during the main game are a little disappointing, too, but Basketball Star does feature some added extras which help to boost winnings. 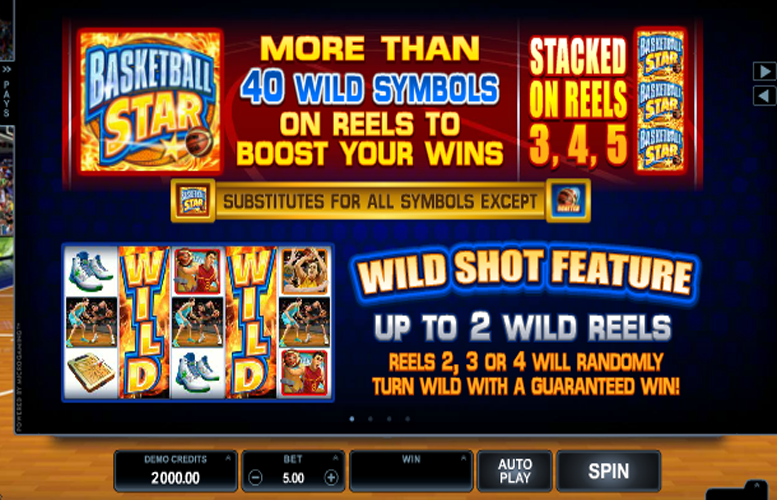 The Wild Shot and Rolling Reels features are the best examples, and can help Basketball Stars players to really rake in the cash.